Senegalese Harpist Seckou Keita was born on 14 February 1978 destined to become a great kora player and percussionist. 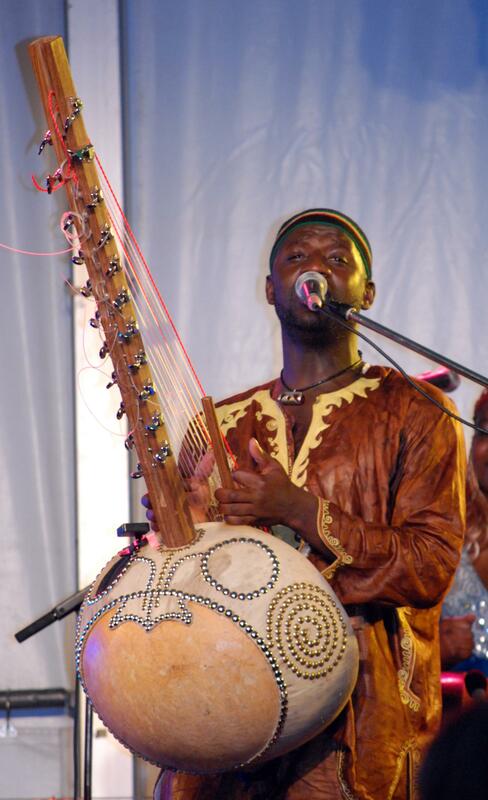 A charismatic live performer and champion of the lesser known 'rocking-kora repertoire' from the south of Senegal. Keita was born in Ziguinchor. Through his father he is a descendant of the Mandeng family of kings, the 'Keita's'. Raised by his mother's family, the Cissokhos, Keita says, "my heritage as a Kora player from a Griot family is what has shaped me. Music is part of my DNA. I was born for music, I have lived and composed music, music is what I breathe for." "In keeping with my unusual heritage I learned not just the traditional kora music of my Griot family, but was drawn beyond to the drums, 'jali dundun' and more. The Seorouba and Sabar of Senegal and the Malinke Djembe. Initially this was a cause for concern within my family, but my hidden pursuit of the percussive instruments of my culture soon led to my promotion to chief drummer as well as kora player." Keita launched his international career in 1996. Under the guidance of his uncle, Solo Cissokho, he appeared at Norway's Forde Festival. In the years that followed Keita relocated to the United Kingdom and travelled around Europe. Touring with his uncle from Norway to Cuba, then to India and finally settling into family life back in the UK. From his UK home he toured with Baka Beyond and worked across the USA and Europe, completed a residency at SOAS, and performed in the Lion King Production and much more. Back in the UK he developed his teaching on the festival scene and became connected with a community of musicians. "I have never forgotten them and participate whenever I can. 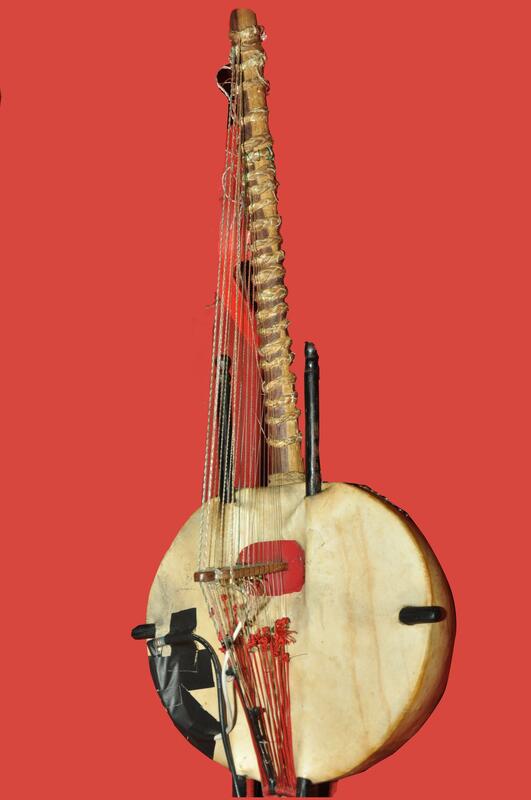 But something was gone from my heart, that was the kora. I began my journey back to my life as a Griot, but now my experience was shared with a global community of fans and musicians. A new Seckou Keita was born." Keita joined the world music group Baka/Beyond as a drummer in 1998, contributing to the East To West album, and in 2000 he began to record his own solo debut Baiyo. He formed the Seckou Keita Quartet in 2004. Keita explains: "In 2000 I had the privilege of playing djembe with the master, Mamady Keita, and I had connections with Sewabeats, Music for Change and Woman Foundation. I kept my djembe skills and heart alive, but my Griot heart was calling me. The same year I decided to record my first album, Baiyo (Mali). It was the beginning of my journey through experimental tunings, personal composition and experiments with the music I have in my blood, that had to find new ways to live and breathe to me. Touring and exploring with this album across the globe with Womad and supporting Salif Keita and Youssou N Dour I found my path. Many projects followed, such as Jaliuklunda, with my family, a huge international success and then a new project with the Seckou Keita Quartet. This formation was the beginning of a new level of international success for me, bringing together musicians and influences from across the globe, truly representing my West-African heart and global experiences." By the end of 2006, the album Tama Silo was released and carried The SKQ on a wave to the "The Silimbo Passage", released in 2008, reaching no. 1 in the iTunes World Music Chart. 400 concerts in 30 countries followed and collaborations with renowned producers, musicians and organisations. In 2011 Seckou Keita joined a new label and started a new musical chapter. Miro was the resulting album, no.1 in the World Music Charts 2012, with a brand new seven piece band, he toured the UK, with special guests, exploring Manding/Wolof roots through the filter of Keita's global influences. Since then Keita has found new audiences and success." The Kora (photo at the right) is a 21-string bridge-harp, built from a large calabash covered with cow skin. The skin is supported by two handles that run under it, and it supports a notched double-free-standing bridge. It doesn't fit into any category of musical instrument, but rather several, and must be classified as a "double-bridge-harp-lute." "You must earn a kora especially built for you"
Seckou Keita explains: "In our traditional Griot family music and stories were passed down through generations from father to son. I was educated in this traditional way and you could say I was destined to become a Kora player. Music was part of my everyday life whether in my grandfather's compound, out in the streets or in the centre of the many local celebrations. Once this music becomes part of you it sticks with you your whole life. There is no formal route to becoming a Kora player, you just have to listen, memorise, and experiment, then keep trying till you get it right. In my grandfather’s house, you are taught how to build a Kora at the age of 7, then by 14 you start experimenting and learning the repertoire. Only when you have earned it, you will have a Kora built for you. I got my first Kora when I was 18." Keita runs drumming and kora workshops in schools, art centres and festivals. He is also a regular guest leader for Sewa Beats, a company that offers corporate learning through rhythm and music. In November 2010, Keita launched a partnership with the International Committee of the Red CROss (ICRC). He will donate 50 % of the proceeds made from sales of his cd, The Slimbo Passage, to support the ICRC's work to protect and assist victims of war and other victims of violence." Recently Songlines magazine has announced that Welsh harpist Catrin Finch & Seckou Keita were the winners of 'Best Cross-Cultural Collaboration' category in the Songlines Music Awards 2014. They have released a compilation album featuring all nominated artists. Keita has a clear vision on what music should be. "Everything in music has to be honest and the deeper meanings of the songs and melodies must be preserved," he explains. "This is why it is important that collaborations should be right for the music, and there are connections between for example Cuban and Indian sounds and the Kora music that can be explored without losing the distinct flavours of the different traditions and styles."